The office of the French president Emmanuel Macron expects "very serious violence" Saturday in Paris, where the movement of the "gilets jaunes" wants to demonstrate again, despite earlier concessions from the government. President Macron calls for calm while demonstrators are calling on him to resign. Tourism bookings for the French capital have fallen drastically. The nervousness of the French authorities can be felt with a new day of violence in the French capital forecasted. "We have reason to fear very serious violence," says the office of French President Macron, as more and more calls are coming in to take action all over France. President Macron yesterday made a "call for calm" to various political and trade union officials, who have all agreed to participate Saturday. 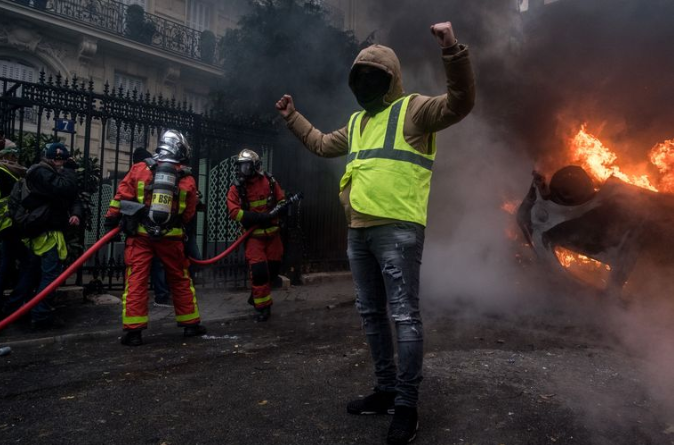 Related coverage: France - ‘Gilets Jaunes’ Continue Protests Despite Macron Promises. At the beginning of this week, the French government decided to make concessions. For example, the price increases of fuel, gas and electricity - which would start at the beginning of next year - will be postponed until 2020. In addition, the plans for stricter safety inspections at the car inspection in France will also be suspended. The government hoped that calm would return with these measures. Paris is still in shock after the riots of last Saturday. Images of the violence went around the world, landing a heavy blow both to the country’s economy and end-of-year tourism. 110 people were injured and more than 400 people were arrested. Related coverage: French Media Shock Over Trump’s ‘Fake News’ Paris Tweets. The government claims that among the demonstrators, "hundreds of vandals" had been merged who had gone down to "fight with the security forces." Four people have died since the start of the demonstrations against the social and fiscal policy of the government. Students and farmers have also joined the protest. Socialism funded by more and more taxes always fails, once the tax paying citizens figure out other are using their efforts and wealth to get richer while they are getting poorer. Good article, perhaps "France: Florescent Vests Selling Like Hot-cakes" would have been a better title rather than Macron's speculation. THE WORLD IS BEHIND YOU FRANCE!!! WE SUPPORT YOUR EFFORTS AND ADMIRE YOUR STANCE!!! GLOBALISM MUST FALL!!!! VIVA LA FRANCE VIVA LA FRANCE VIVA LA FRANCE!!! GOD BLESS YOU AND GRANT YOU SOVEREINTY AND VICTORY!! !